Thank you so much for everything, everyone thought the bus was fantastic, and the sign on the front! Thank you so much for everything, everyone thought the bus was fantastic, and the sign on the front! And we all had a fantastic journey to the prom! Apologies to the two drivers who had to listen to us and some rather terrible singing. I thought you might like to see a picture of a small group of us before we left. Thank you so much once again, and I will definitely be recommending you to people in the future. ...huge thank you for the service you provided at my daughters wedding last week. People have not stopped talking about the buses all week! The buses were fantastic, clean as a new pin and totally appropriate for a London wedding. It was a brilliant way of moving quantities of excitable people from church to reception. 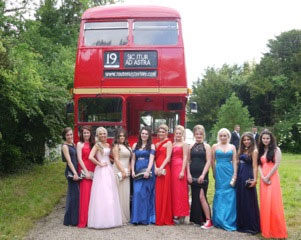 Contact Routemaster Hire Ltd - The Old Cottage, Pooleys Lane, Welham Green, Herts. AL9 7LQ.